Group Lessons: introducing historical context to the beginner student. Things have been really busy lately, so it has been quite a while since my last post. This post was actually intended to be about effective practice, in light of considerations from the music education expo I attended in March; however! The sheer size of the subject means I cannot even hope to do it justice in one post. Instead, my approach to that subject is going to be a series of shorter posts that hopefully will be appearing soon (if i’m organised). Here, I am going to share details of my last group lesson. Group lessons are a brilliant way for students to meet and explore different areas of piano (and music in general) that may rarely be touched upon in individual lessons for various reasons. Summer exams have just finished, and in the build up to exam time we are even more pushed for time than usual. Week to week we may be concentrating on learning pieces, technical work and theory, and therefore don’t have any time to learn about the context our pieces were written in, who they were written by, and the stylistic considerations of the period. Enter group lessons! Although I consider myself to be a classical piano teacher, many of my students – believe it or not – believe that they have never listened to any classical music outside of their lessons. In this group lesson my students realised that this was not actually the case! The prominence of well known classical music in modern culture means that many young people listen to classical music pretty regularly without necessarily knowing in TV, film, games and advertising. ‘Who’s heard of Beethoven?’ I ask, once my 5 students (age 6-8) arrive. ‘Nooo‘ they reply in unison. One of them raises their hand and says, ‘the dog?! 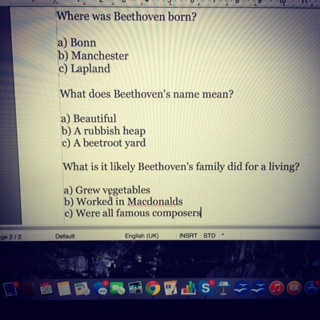 I have the first movement of the moonlight sonata playing in the back ground and 4 out of 5 students claim to recognise it, but they are not sure where from. After some prompting, we have established that Beethoven is ‘that guy’. You know, the ‘Ode to Joy’ guy! Most group lessons are jam packed with games, however this one was a little more reading and listening heavy and required the students to really concentrate. It was also a bit of a trial for how I intend to structure groups next year – one project covering quite a large area split into three 1 hour and 30 minute sessions. This particular session only lasted 45 minutes, so we were working pretty fast. 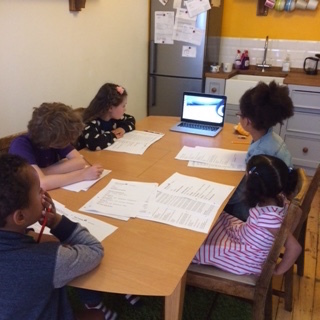 After establishing – minimally – who Beethoven was, I showed my students a video from Classic FM, called the ‘fast and friendly guide to Beethoven’. There are also guides to many of the well known composers – they’re pretty fun which is why I thought my students would like them. Give them a watch! The videos are full of facts in chronological order and are really fast, so I thought it would be good to write a questionnaire based on the video. For each question there were three possible answers. The students loved how fast paced it was (and also how i’d written some silly answers just for fun). 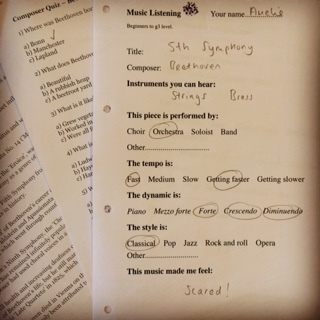 After the questionnaires were completed we took turns in reading bullet points from a short biography of Beethoven, again, from the classic FM website. I had copied and pasted it into a document and changed some of the language so it was more accessible for the younger ones. During the reading, we paused to listen to extracts of four of Beethoven’s works: Moonlight Sonata (1st movement), Eroica, and his 5th and 9th Symphony. After each extract we completed a listening exercise from Fiona Lau. The listening exercise encourages students not only to listen to what kinds of instruments are playing, and how they are playing, but to consider their own emotional responses to the music as well which is always very interesting. In 45 minutes all the students thought they had covered a lot in the time we had, and learned a lot. However, the most important thing for me was introducing my students to listening to classical music both for enjoyment and evaluation. Eventually I want to do a similar kind of class with a few composers from different musical periods so we can create a timeline and an overall ‘skeleton’ knowledge of western classical music that we can develop together over time. Thank you – I’m new to your blog and found this (and your other posts) really interesting and useful – I’m looking forward to exploring some of the resources you mention. Thank you for reading and commenting, Julia! I’m glad you have found the posts useful.